The phrase 'works of the law' occurs only in the Dead Sea Scrolls and in Paul, but it has a different connotation in each corpus. 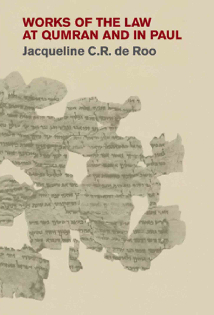 At Qumran, the 'works of the law' are deeds of obedience to God's law, and are ultimately inspired by God. They function as a means of atonement, whether for the individual who performs them or for the sins of others. For Paul, on the other hand, the 'works of the law' are quintessentially the works of Abraham. Though they are indeed good deeds, Abraham himself was a sinful man, and so his deeds could not make atonement for himself or for others. In fact, Paul is reacting against the idea of Abraham as a redeemer figure that was held by some of his contemporaries. The phrase 'works of the law' thus takes on a negative coloration in Paul, as a deceptively false means of salvation. In contrast to Qumran, Paul's position is that justification must be effected 'apart from works of the law', and thus by Jesus Christ. Abraham is no 'second Adam', as some were thinking, and his good deeds, epitomized in his sacrifice of Isaac, had no atoning value. This closely reasoned study makes an important contribution to the study of New Testament theology; it undertakes to settle some long-standing debates about Paul's soteriology by proposing an alternative both to traditional interpretation of Paul and to the 'New Perspective on Paul'. Jacqueline C.R. de Roo is a Research Associate for the Dictionary of Classical Hebrew, Department of Biblical Studies, University of Sheffield.